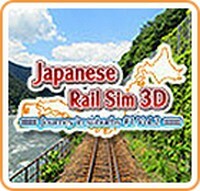 Family Friendly Gaming was provided a download code for Japanese Rail Sim 3D Journey in Suburbs #1 Vol 2 on the Nintendo 3DS. I appreciate that. I also appreciate this hand held video game. Japanese Rail Sim 3D Journey in Suburbs #1 Vol 2 is hard. At least for my age. I know adults even said Japanese Rail Sim 3D Journey in Suburbs #1 Vol 2 is a hard Nintendo 3DS game. I got better in Japanese Rail Sim 3D Journey in Suburbs #1 Vol 2 with practice. The more times I did one of the runs the better I got. Japanese Rail Sim 3D Journey in Suburbs #1 Vol 2 has plenty of things to keep track of. There is speed, distance, brake pressure and more. I also found out that I have to wait for people to get on the train before I take off. There is a light for the door. Once it is lit then you can release the brake and start to move forward. The controls in Japanese Rail Sim 3D Journey in Suburbs #1 Vol 2 are easy to understand as long as you have a basic reading ability. Japanese Rail Sim 3D Journey in Suburbs #1 Vol 2 tells you in writing what to do next. There are not verbal commands for those not capable of reading. It would have been nice since I had trouble with some of the words in Japanese Rail Sim 3D Journey in Suburbs #1 Vol 2. There are a total of eleven tracks to drive on in Japanese Rail Sim 3D Journey in Suburbs #1 Vol 2. Families can redo them to achieve a higher score. Avoid going over the speed limit on curves, and other areas in Japanese Rail Sim 3D Journey in Suburbs #1 Vol 2. The game will fine you for going too fast. It never fined me for going too slow though. The down side to going too slow is you will arrive late, and that is fined. The coolest thing about Japanese Rail Sim 3D Journey in Suburbs #1 Vol 2 is the information on the trains, stations, and more. Japanese Rail Sim 3D Journey in Suburbs #1 Vol 2 is entertaining and educational at the same time. There are four total volumes of the Japanese Rail Sim 3D Journey in Suburbs #1. All of them combined create the entire run. I would love to see all four put together on a cartridge and released in the future.